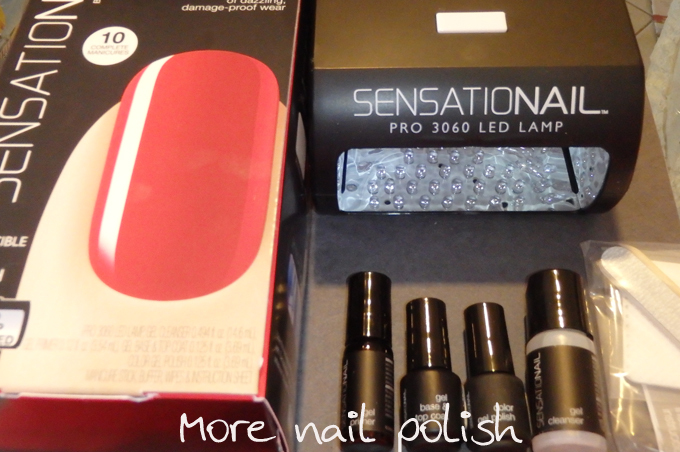 Today I'm continuing my collaboration with Nailene and Sensationail to bring you a review of the Sensationail at home gel polish starter kit. This kit also forms part of the huge prize pack that one Aussie will win. Their are two Sensationail starter kits, they are both exactly the same except for the coloured polish. One contains the shade Raspberry Wine and the other Scarlet Red. I received the Scarlet Red kit. The small box is quite deceiving in what it contains, as it's actually jam packed full with everything you will need to create a flawless long lasting manicure. The starter kit contains the Pro 3060 LED Lamp, gel cleanser, gel primer, gel base and top coat, gel colour, lint free wipes, double sided nail file, manicure stick and an instruction sheet. The instructions are nice and clear and they detail each step from prep to curing and removal. I'm going to step you through the process I did. The first step in the instructions says to file and gently buff the nails. I did a quick file using my Mont Blue glass nail file, but I didn't buff my nails as I didn't need to ensure this manicure lasted more than a day! If I were attempting to wear a gel mani for more than a day, I would lightly buff with a fine grit sponge file to get a nice surface for the gel to stick to. Next step it so apply the gel cleanser, it smells just like rubbing alcohol. Step three is to apply one layer of the gel primer and let it air dry. Lacquer up - apply a thin layer of the gel base and top coat, being careful to avoid the skin and cuticle. They even remind you to cap or wrap your tip with the gel polish . Cure for 30 seconds. 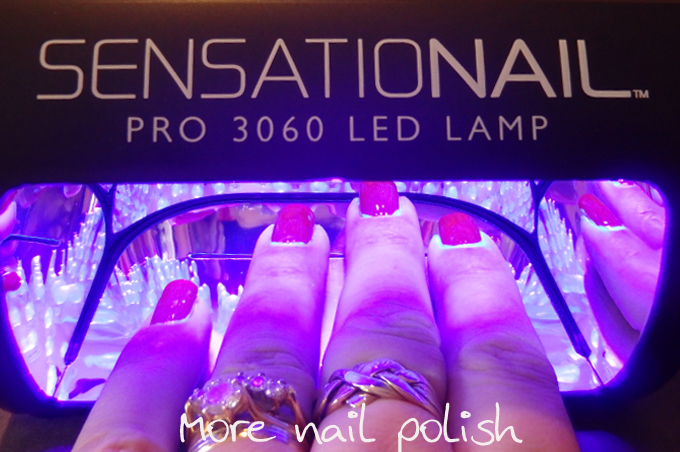 The Sensationail lamp has a button on the top to turn it on. The lamp beeps at 30 seconds and then turns off after 60 seconds. Whoa, look how that gel base and top coat glows. Apply a thin layer of the gel colour, wrap the tip and cure for 60 seconds. Repeat with a second coat of gel colour. 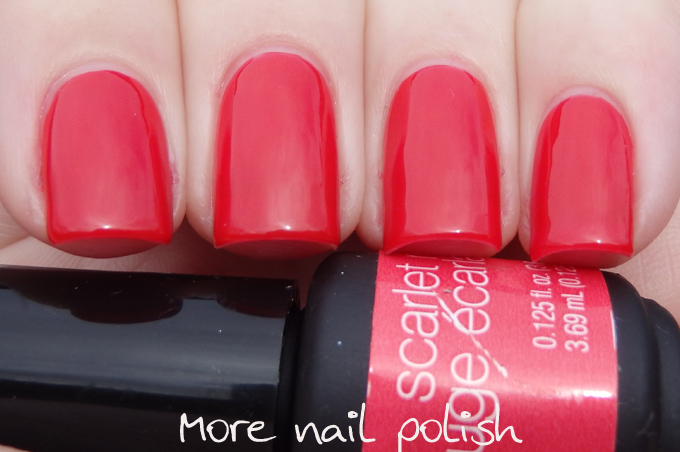 Scarlet Red was a nice and strong opaque colour. One coat was nearly opaque on it's own. Apply a thin layer of the gel base and top coat, wrap the tip and cure for 30 seconds. Finish off by removing the sticky residue using the gel cleanser and a lint free wipe. The above photo shows how bright the red is in indoor artificial lighting and below shows the polish outdoors in natural overcast daylight. 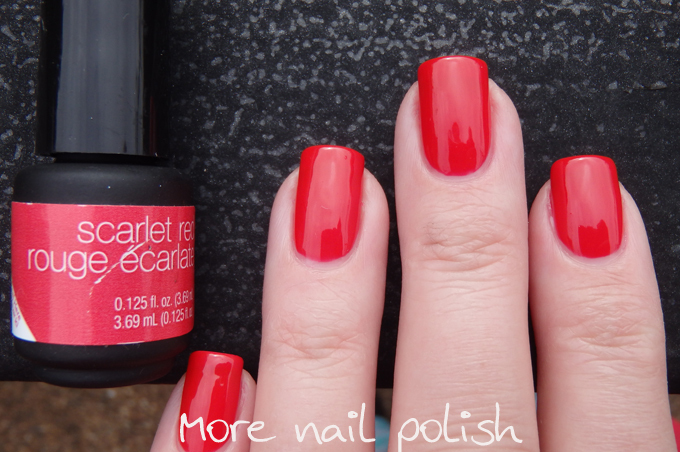 Scarlett Red is a rich red creme. 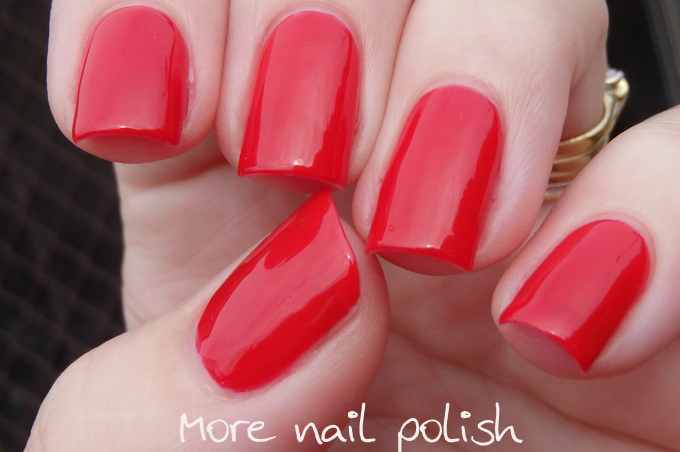 Nothing particular amazing about the colour, except that it's a classic and will always look professional on your nails. 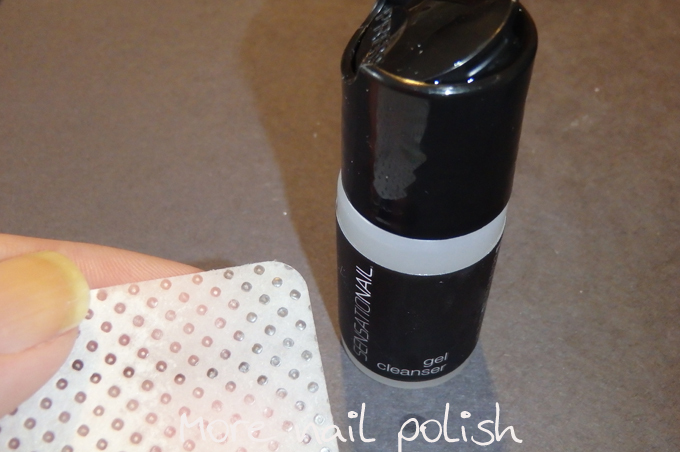 Step 1 - file the glossy gel finish off the top of the nail. Step 2 - Soak nail in acetone remover. I used the foil method for this one, which is explained in detail on the instruction booklet. 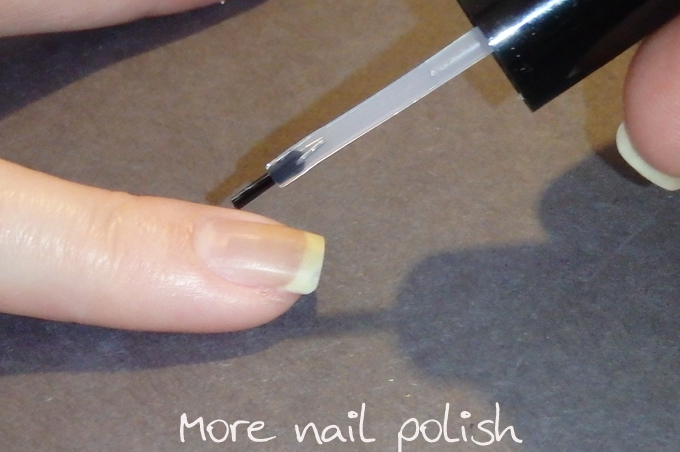 Step 3 - use the manicure stick to gently push the peeled up polish off the nail. 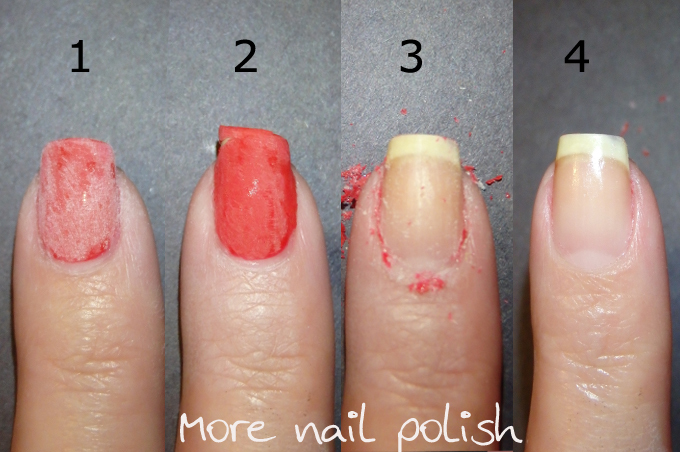 Step 4 - clean the nail with some remover to get the last bits of polish off. 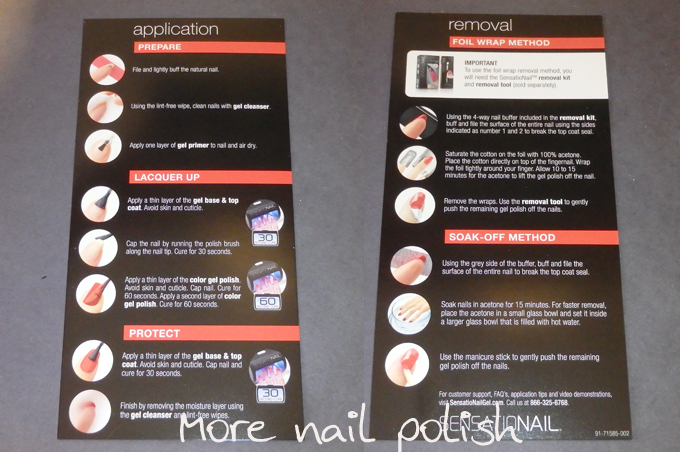 Here are some of the things I loved about the Sensational Gel Polish kit. The lamp has the auto timer so you don't have to sit watching the clock. Removal in general was clean and easy. The lint free wipes. I usually just use cotton rounds I buy from Aldi, but they can get fluffy. I love these lint free wipes and a single one lasts for many manicures. The gel polishes are very thin, but still pigmented. Even at four coat (base, 2x colour + top) it doesn't end up looking thick and chunky. The starter kit price is very affordable at $89.99. The fact that the starter kit includes a full sized LED lamp is great. 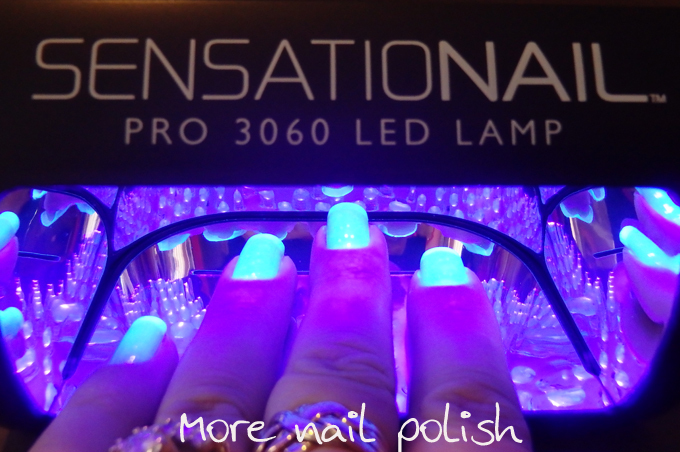 Other brands have just the LED lamp costing $99.95 without any of the gel polish products. The finished nails look glossy and smooth and although I can't specially comment on the wear time as I haven't done a wear test on these yet, they were certainly perfect and chip free for the time I did wear them. You have to file off the top coat when it's time to remove. It just felt wrong using such a coarse grit file on the top of my nails. Even though I know I wasn't even close to my nail, it just felt... weird. This is exactly the same as the Orly SmartGELS so it wasn't something unique to this brand of gel polish. The gel colour and gel base and top coat included in the starter pack are really small at only 3.69ml. The packaging reckons you get 10 manicures out of it, but I reckon you would only get half that many. On the up side, the separate colours you can buy are more generous at 7.39ml. The Sensationail Gel polish starter kit is available online from Sensationail.com.au. 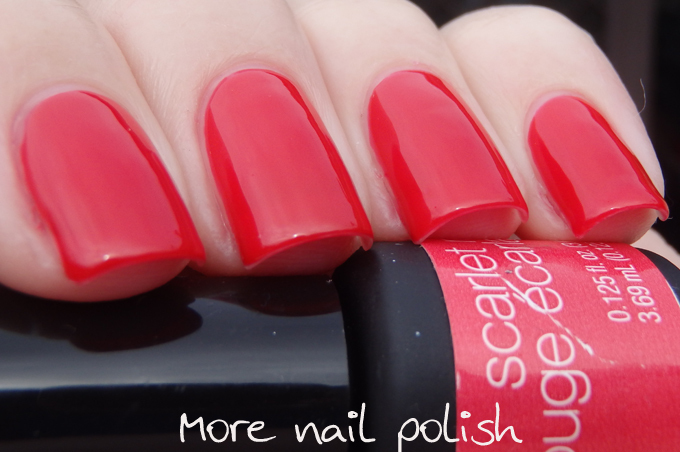 Sensationail products can also be purchased in store at Priceline, Woolworths, Terry White chemists, Chemmart and Target. Below is the same Rafflecopter Widget, so if you have entered already you don't need to enter again. For more information on Sensationail by Nailene, follow Sensationail on Facebook or Instagram. 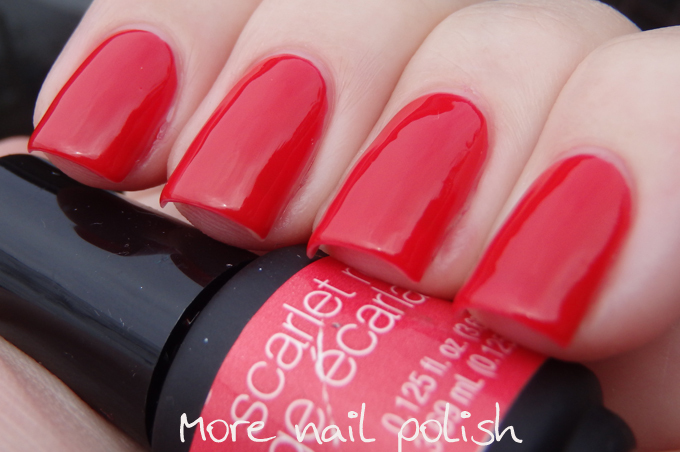 I like this product, the red polish is lovely. Ooh pretty! I'm in need of a classic red like this one. I have this kit (it's sometimes on Groupon for $40, that's how I got mine) and I can attest to the polish's longevity. Lasts 2 weeks easy, if you buff your nails well first. Great review! I found buffing a bit scary, as it's a nice way of saying sandpaper your nails isn't it? Because I went over the lines on application I could easily peel it off, though atm stuff have a few parts left. This product- Nailene Artificial Nail & Polish Remover tub- is a fabulous. Reduces the mess amazingly.